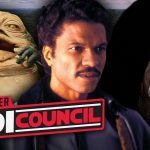 Collider Jedi Council: Will Any Other Original Trilogy Characters Appear in Episode IX? The post Collider Jedi Council: Will Any Other Original Trilogy Characters Appear in Episode IX? appeared first on Star Wars News Net. Collider Jedi Council: Is the Obi-Wan Series a Sure Thing? Collider Jedi Council: Is Disney and Lucasfilm Putting Their Star Wars Story Spinoffs On Hold? A leg up on some information on Forest Whitaker in Rogue One: A Star Wars Story. [Communauté] Générations Star Wars & Science-Fiction 2018 : le compte-rendu ! New Star Wars: The Force Awakens International Poster!